In two dramatic cliffhangers, Ryan Li beat Eric Lui in back-to-back games Friday to sweep the AGA Pro Qualification Tournament finals, becoming the American Go Association’s fourth professional. Li had won their game in the round-robin section earlier in the week, so Friday’s wins gave him a 3-0 sweep of the best-of-five finals (he only dropped one game in the entire tournament, against Matthew Burrall). Click here for results and game records and check out the AGA Facebook page for photos. 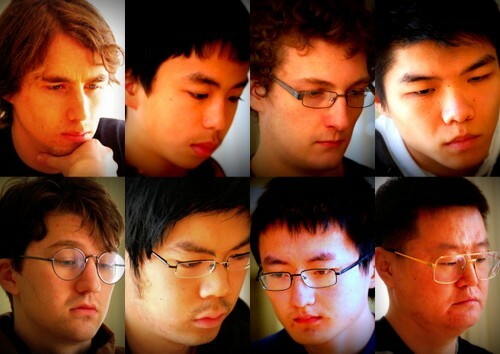 “Eric was a really tough opponent,” Li told the E-Journal after the final round. “I definitely felt a lot of pressure from him and just wanted to try my hardest, do my best and see what happens. It’s still all sinking in.” Li is in his third year at the University of Toronto, where he’s studying physics. He’s also an avid soccer player. His future go plans are a bit up in the air at the moment. “I had planned to play in the World Amateur Go Championships this year but of course now I can’t do that,” he said, laughing. Lui took a solid cash lead early in the morning game and hundreds of viewers on KGS thought he seemed to be in a good position after deftly surviving Li’s splitting attack. But Li kept up the pressure and as Lui went into byo-yomi, the game kept getting more and more complicated. Eventually, with the life and death of multiple groups at stake, several huge kos and even a seki, both players were battling the clock as well and in the end, Lui, behind on the board, lost on time as well. In the other two morning games, Jeremy Chiu’s kill of Ben Lockhart’s large central group evened the score at 1-1 in their battle for third place in the tournament, while Matthew Burrall’s win against Daniel Gourdeau put him within one game of clinching fifth place (Gourdeau lost their match in the round-robin section earlier in the week). The afternoon game between Li and Lui was another no-holds-barred contest, closely followed by hundreds on KGS, who were also treated to a live commentary by Myungwan Kim 9P, with Andrew Jackson. The other two afternoon games were each decided by half a point, Lockhart defeating Chiu to take a 2-1 lead, and Matthew Burrall beating Gourdeau to claim fifth place. Lockhart and Chiu will continue their struggle for third place — and seed in the next pro tournament — in a game Saturday at 9:30a that will be broadcast on KGS; if a fifth game is needed it’ll be played and broadcast at 4p (EST). 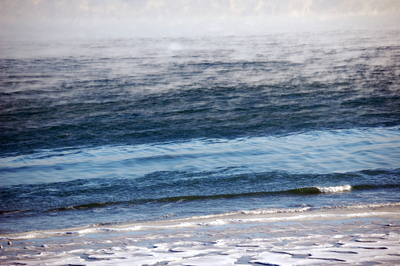 Though frigid temperatures on Thursday closed schools around Boston and coated the Nantasket Beach with frozen surf, the action was hot on the boards at the AGA pro qualification championship. 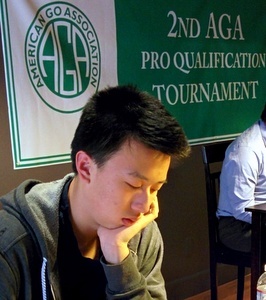 Ryan Li returned to form Thursday morning in the deciding AGA pro qualification championship top-bracket match against Matthew Burrall, taking just 120 moves to win the game, another crowd-pleaser with plenty of complicated fighting. Li advances to play Jeremy Chiu in the next round, which will be broadcast live at 4p Thursday on KGS. Click here for latest results and game records. Eric Lui awaits the winner of the Li-Chiu match, having defeated Ben Lockhart Thursday morning to assure his berth in the semi-finals. In the other morning match, Daniel Gourdeau, still battling a nasty cold, needed just 118 moves against Ricky Zhao to advance to the next match, which will be played on Friday against Matthew Burrall. 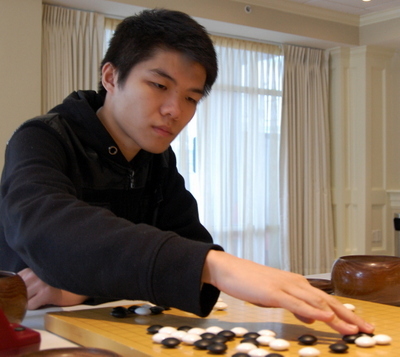 Zhao placed 7th, as Yuan Zhou had to withdraw due a family emergency. After winning both rounds on Tuesday, Ryan Li 7d and Eric Lui 7d – both 6-0 – have locked up the top-seed positions for the final stage of the AGA Pro Qualification Tournament (APQF). They’ll meet Wednesday morning (9:30a on KGS) for the round-robin’s final game; in the event that they meet again in the finals, the result of this game will count towards the final result. 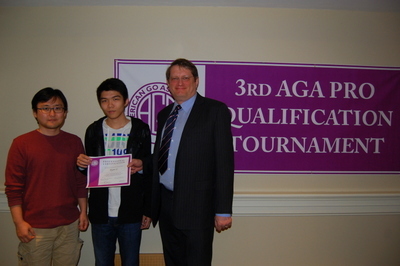 The APQF Championship section begins Wednesday afternoon (4p on KGS) to determine this year’s AGA professional. In the modified single-elimination tournament, one player will emerge with the designation of Professional and two runners-up will be named as seeds for next year’s tournament. Click here for latest results and game records, as well as an explanation of the tournament format. Round 5: In the game between Eric Lui and Yuan Zhou, Zhou’s premature attack in the early middle game resulted in a trade that left both players with large territories, but Lui’s was larger as both players finished a peaceful yose; when Zhou’s two stones were cut off in the middle there was no place left to catch up. Ricky Zhao made a very sharp attack on Ryan Li’s upper side group, but once Ryan settled, Zhao’s invasion of the right side couldn’t reduce Li enough. A fairly quiet game between Ben Lockhart and Daniel Gourdeau got exciting quickly when Lockhart cut off a large group of stones in the center. Gourdeau found a ko for life but had to give up too much to win it and came up short by 12.5 points. Matthew Burrall and Jeremy Chiu’s balanced game with large territories was upended when Chiu lived in sente in Burrall’s corner while Burrall was in time trouble, forcing his resignation. Round 6: Daniel Gourdeau came out of the opening slightly ahead and when Jeremy Chiu made two slow moves in the middle game Chiu fell further behind and resigned after 143 moves. Ben Lockhart got in trouble early against Ryan Li and though he complicated the game effectively, Li converted enough of his thickness to territory to win by resignation. When Ricky Zhao’s attack on Eric Lui’s unsettled group fizzled, he was never able to erase Lui’s territorial advantage and Lui won yet another resignation. Lastly the lead shifted hands several times in the game between Yuan Zhou and Matthew Burrall, in the end coming down to a ko that proved decisive in Zhou’s half-point win. One of the highlights of the day was the appearance of Myungwan Kim 9P and his friend and student Mark Lee — the 2014 US Open Masters Division winner – as game recorders, pitching in on the E-Journal team to ensure that all the games were broadcast. Kim will be doing a live game commentary on the Wednesday morning round, starting around 10:30a. photos: top right: Myungwan Kim fills in as a game recorder on Board 1 while EJ Managing Editor Chris Garlock takes photos; bottom left: Mark Lee records the Board 3 game between Ryan Li and Ben Lockhart. 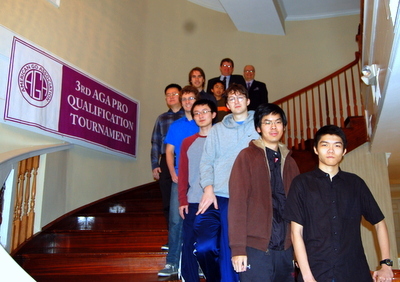 Ryan Li and Eric Lui, undefeated after four rounds, are leading the race for the 2015 AGA Pro Qualification Tournament finals later this week. Ben Lockhart is close behind at 3-1. Click here for latest results and game records. Rounds 5 and 6 will be broadcast live on KGS at 9:30a and 4:00p Tuesday. Monday dawned bright and chilly as a stiff breeze out of the north blew away the few remaining storm clouds off the coast in Hull, Massachusetts. Ben Lockhart arrived early at the US Pro Qualification Tournament playing area in search of coffee, and the rest of the players arrived just before the 9:30a start of the third round. Ricky Zhao was the last to arrive, slipping into his Board 1 seat opposite Jeremy Chiu seconds before TD Jeff Shaevel officially began the round. His was the first game to finish when a battle between three running groups claimed a fourth and Zhao resigned a few moves later. On Board 2, Yuan Zhou had a very difficult time after Ryan Li reduced his only territory to a manageable size and Li won comfortably, extending his winning streak to 3-0. The game on Board 3 was a marathon effort by both players, with Matthew Burrall prevailing over Daniel Gourdeau by just 1.5 points. Eric Lui effectively exploited the potential aji of an earlier trade to cut off Ben Lockhart from the center and take control of the Board 4 game and Lockhart notched his first loss, while Lui went to 3-0. With the sun shining brightly but temperatures steadily dropping into the teens, the players gathered Tuesday afternoon for the fourth round in the Minot Ballroom at the Nantasket Beach Resort. Matthew Burrall took on Benjamin Lockhart on Board 1 and as usual sketched out a massive moyo that Lockhart then reduced while attacking Burrall’s one weak group on the board. After an exciting ko fight the game was nail-bitingly close but Lockhart had a narrow lead that Burrall, down to his last byo-yomi period, could not erase and he resigned. On Board 2 Yuan Zhou prevailed over Ricky Zhao, patiently enduring a small disadvantage until choosing the last possible moment to live in Ricky’s corner. Daniel Gourdeau had the unenviable task of trying to derail the Ryan Li Express on Board 3 and though he managed to deftly fend off several severe attacks, by the middle game Li was already ahead on the board and Gourdeau still had problems to deal with and resigned. Jeremy Chiu had a similar problem on Board 4 in his game against Eric Lui, the other undefeated player, and though he lasted a bit longer, the result was the same, with Lui notching his fourth win by resignation. Lui, by the way, is the front-runner in a “Who will become the next AGA pro?” poll on lifein19x19.com. With a total of just 13 votes recorded thus far, Lui has 7 votes, Ryan Li has 4 and Yuan Zhou and Ben Lockhart each have one. Ryan Li, Eric Lui and Ben Lockhart won their first- and second-round games Sunday at the AGA Pro Qualification Tournament to take an early lead in the 7-round round-robin section of the two-part tournament. Click here for complete tournament results and game records. 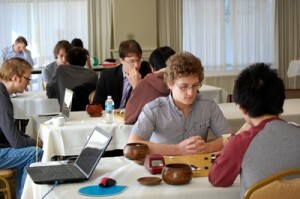 The tournament is being held at the Nantasket Beach Resort in Hull, MA, January 4-10. The games are being broadcast live on KGS by the E-Journal at 9:30a and 4:30p (EST). 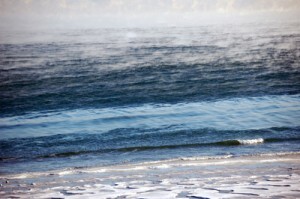 Temperatures had risen overnight, melting the snow that had fallen Saturday night, and a few hardy surfers could be glimpsed in the waves just across the beach from the resort. 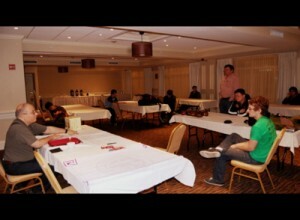 The players posed for a group photo (right) before the first round and the tournament commenced shortly afterwards. The seaside town is quiet this time of year, matching the silence in the playing room as the top-ranked players grappled on the boards. Hundreds watched online as fierce battles unfolded; three of the first-round games were decided by resignation. Jeremy Chiu was the first to fall, resigning his Board 1 game after just 89 moves after a bad start when he misplayed a joseki that allowed Ryan Li to capture a group in the corner and get outside thickness. 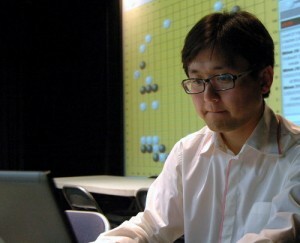 Chiu mounted a creditable attack on one of Li’s groups but Li played calmly and when he settled his group Chiu gracefully gave up. On Board 2, Matthew Burrall started a complicated middle-board fight because he was behind on points against Eric Lui, but came up a couple of liberties short and had to resign. And on Board 4 Daniel Gourdeau and Ricky Zhao’s even bigger and more complicated fight ended when Gourdeau used an attack on Zhao’s center group to cut off and kill another group. The Board 3 game between Ben Lockhart and Yuan Zhou was the last to finish and the only one to be counted. Observers thought Zhou had a small lead coming out of the middle game but he was short on time and Lockhart played a very sharp endgame to win by a comfortable 10.5 points. The town was completely fogged in by the time the players reconvened at 4:30p for the second round. What few sounds there were over the next few hours were distant and muffled as the players focused even more intently than they had in the morning round. At one point a loud argument between two hotel patrons erupted just outside the playing room but the players were so engrossed that no-one seemed to even notice. The Board 1 game between Matthew Burrall and Ryan Li was a classic territory vs. influence game involving some very fluid positions and deep reading. Though Burrall did manage to establish a fairly substantial central moyo in the end it wasn’t enough to compensate for Li’s bankable territory. On Board 2 Daniel Gourdeau’s slight joseki mistake gave Eric Lui an early cash lead; unable to recover, Gourdeau was the first to resign in the second round. Ben Lockhart and Ricky Zhao met on Board 3 in an exciting game that saw a number of daring trades but in the end Zhao came up short and had to resign as well. On Board 4, the youngest and the eldest player in the field faced off: Yuan Zhou, 40, has won many US titles and is an experienced teacher and author of go books, while 12-year-old Jeremy Chiu is one of the US’ strong youth players. Neither player made any blunders and the game stayed knife-edge close right through the end. 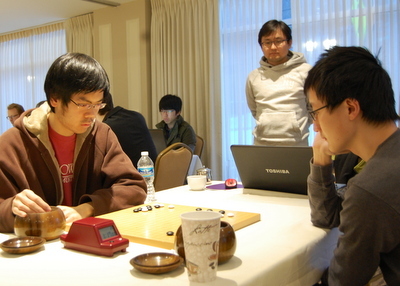 It was the last to finish — fortunately, AGA President Andy Okun teamed up with Brian Lee to record the 4-hour game — and Chiu edged Zhou by just 1.5 points. Morning rounds will begin at 9:30a and afternoon rounds at 4:30p and the games will be broadcast live on KGS; watch the AGA website, Twitter @theaga and Facebook feeds for regular updates. - report/photos by Chris Garlock. 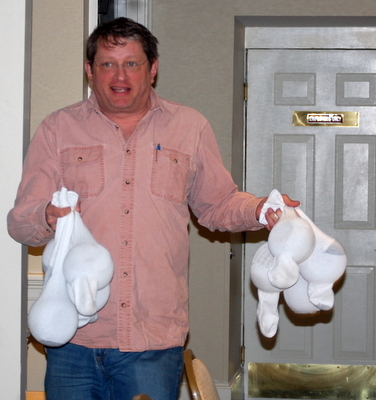 Photos: (left) Okun delivering the tournament’s go stones and bowls; (right) Shaevel reviews rules with players. The 2014 US Open has now been rated. Click here for the AGA ratings page where you can search by name or AGA membership number. You can also see the final wall list here.